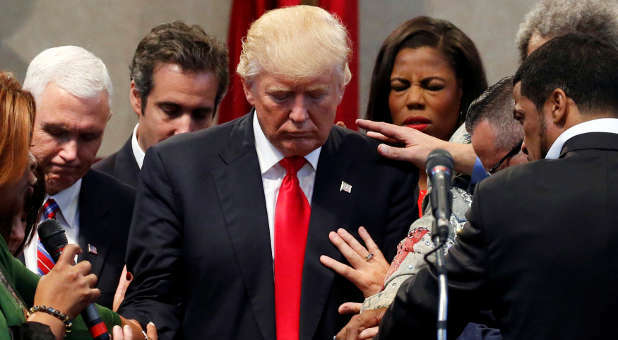 (Reuters/Johnathan Ernst)President-elect Donald Trump is blessed by Christian leaders. U.S. President Donald Trump continues to bewilder and alarm those trying to make sense of his utterances. Many Christians are wary of the president's proclivity to swerve away from keeping the Commandments that guide behavior. They see him as having given up totally on the eighth and ninth – the ones regarding truthfulness – rather joining a choir of mockery on truth and those who expose matters untrue he has been caught stating. It is relation to his disregard for the commandments on truthfulness that some Jews see a disconnect to the president's cozying up to Israeli President Benjamin Netanyahu and his having a daughter who converted to Judaism and her husband who is part of his inner circle. American Jewish leaders on Feb. 20 called on Israel's Justice Minister Ayelet Shaked and his government to convey to the Trump administration the urgency of condemning and combating a rise in anti-Semitism in the United States, The Times of Israel reported. Addressing the Conference of Presidents of Major Jewish Organizations in Jerusalem, Shaked asked members of the audience whether they felt a rising tide of anti-Jewish sentiment, and how they thought Israel should respond, in one of the first acknowledgements from an Israeli minister of the trend. JCC Association of North America chair Stephen Seiden told the minister that 56 Jewish community centers had received bomb threats over a three-week period, including some that had "received multiple threats." "Anything Israel can do to convince our new president to address the issue head-on, that anti-Semitism is a problem, to acknowledge it, I think would go a long way," he said. The bomb threats have "created fear in many of our members." The AJC Global Jewish Advocacy group said it was "dismayed" after Trump's outburst. "The purveyors of anti-Semitism are many, including, it must be said, some who claim to be your supporters, but others as well with entirely different political agendas. We need the help of the government to combat this cancer, which violates every value for which our nation stands. "Respectfully, Mr. President, please use your bully pulpit not to bully reporters asking questions potentially affecting millions of fellow Americans, but rather to help solve a problem that, for many, is real and menacing." Sarah Wildman writing in Vox echoed those words, "President Donald Trump could have used his bully pulpit this week to reassure Jews who are fearful of rising anti-Semitism in America. He took two chances for targeted messaging to talk, instead, about himself." Vox said he skirted an easy opening to assure concerned American Jews that their president is behind them. Instead he roughly pushed back the Orthodox Jewish reporter whose questions were about he might be doing pro-actively, to address those who are attacking the community. "This request was a long time coming. "For many Jews, the moment brought home a concern that has rankled for many months. By halfway through 2016, there was a persistent, palpable, even terrifying, sense within the community that we had suddenly entered into a new era of popular anti-Semitic permissiveness, one where what was once fringe thought and speech had been mainstreamed and magnified by social media." It cited tweets that brought in anti-Semitic imagery during the U.S. presidential campaign such as a six-pointed Jewish star, superimposed upon a pile of money that was later sworn to be a "sheriff's star," and surrogates who tweeted images of Pepe the frog, a favorite of the so-called alt-right. Vox also noted deep concern about the stories published by Breitbart news, former news home of Steve Bannon, a leading campaign advisor turned White House right-hand man, which didn't shy away from speaking negatively about Jews. "What will it take for Donald Trump to condemn Anti-Semitism," began an op-ed in the Jewish daily Forward by Kenneth Stern, executive director of the Justus and Karin Rosenberg foundation that fights anti-Semitism and hate crimes. He called the president a "serial enabler" of anti-Semitism and white supremacists, and noted an incredible lack of empathy conveyed over 48 hours. The Jewish Orthodox reporter had said to Trump, "Forty-eight bomb threats have been made against Jewish centers all across the country in the last couple of weeks," a reporter from an Orthodox magazine said. "There are people who are committing anti-Semitic acts, or are threatening to —"
Trump interrupted. "Okay, sit down," he said before going on to call himself the "least anti-Semitic person you have ever seen in your entire life." Josh Nathan-Kazis wrote in the Forward on Feb. 17, "What Trump did not do was condemn anti-Semitism." Forward carried a piece headlined: "Neo-Nazis Cheer Trump For Bullying Jewish Reporter — Blacks And Mexicans Too," written by Allison Kaplan Sommer in Haaretz on the same day. A reporter for Ben, a small ultra-Orthodox publication, had a dream turn into a nightmare when President Trump called on him during a rare solo press conference — and then slammed him. Reporter Jake Turx was said by the Forward to have long wanted to participate in such a high-level event, even publicly pleading with Trump's spokesman Sean Spicer to call on him. The much-discussed interchange took place at the president's extended and world-wide watched press conference Feb. 16. Sommer reported it was unclear whether Trump was angry at Turx because, as he said, he had requested an "easy question," or intentionally misunderstood Turx to be accusing him of being an anti-Semite. The mere suggestion of personal anti-Semitism was all that Trump seemed to hear from Turx and he unleashed a characteristic response. "Number one, I am the least anti-Semitic person you have ever seen in your entire life," he said. "Number two, racism. I am the least racist person... [Turx] said he was going to ask a straightforward question," Trump harrumphed. "Well, welcome to the land of the media. I hate the charge." "You heard Netanyahu, Bibi," Trump continued, alluding to the previous day's joint press conference with the Israeli prime minister. "He said, 'I've known Donald a long time,' and he said 'Forget it,'" Trump concluded, referring to the change of anti-Semitism. Forward said a different suggestion has been offered by Bradley Burston in Haaretz. "Donald Trump IS an anti-Semite," he wrote. "A man who initiates, fuels, and fans anti-Semitism, a man who is in a direct position to combat it and does not, is, in my view, an anti-Semite."